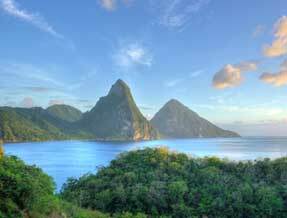 Look forward to glorious white sands and days of relaxation as you browse the selection of St Lucia hotels. Enjoy the barefoot luxury of St. Lucia's Windjammer Landing Villa Beach Resort. Windjammer Landing provides guests with everything they need to create a memorable experience that is uniquely Saint Lucian. On the southern St Lucian coast this hotel is split into two sections, Harmony, the adultsonly side and the family-orientated Splash. This romantic, boutique-style hotel has been created as a haven for couples. Set on a two mile stretch of white sand beach, just a short distance from the island's capital, Castries, Rendezvous is an idyllic and intimate Caribbean couple-only hideaway. Prepare to be pampered in the ultimate experience for mind, body and soul. This idyllic beachfront property is set in lush tropical grounds on a picturesque hillside. and this rather special health and wellbeing resort opens onto secluded Cariblue Beach. Set upon its own breeze-cooled Sunset Bluff in 210 acres of landscaped grounds and with its own beautifully manicured golf course, every detail has been considered to make this a wonderfully romantic and intimate escape. If it's a romantic getaway you're after, look no further than the selection of accommodation on offer in St Lucia. Forget about your hassles and take advantage of some of the best all inclusive hotels in the Caribbean, many of which have won awards for the standard of their service. The spectacular scenery is brought about by the mountainous nature of the island, particularly in the south west corner, where the magnificent volcanic cones of the Petit Piton and Gros Piton burst out of the shimmering blue waters. Numerous hotels offer picturesque views of this striking scenery, a perfect backdrop for a cuddle in your balcony's hammock or an amorous evening meal with your loved one. St Lucia is not to be considered only for the lovebirds of the travelling world however, thanks to the abundance of all inclusive hotels available. If you're taking the kids, head to Rodney Bay Village, the island's only resort, where you can find many hotels, plenty of activities and a charming marina.